As part of the DaeSSy mounting system a Quick Release Base is attached to the horizontal tube of the mount. Devices are fixed onto a Holder Plate which then slots onto the Quick Release Base and is secured with a pin that clicks into place. To detach a device this pin can be 'unlocked' by pulling the release ring on the back and then sliding the device (and holder plate) out of the slot. Quick Release Bases are available in various styles with different functionalities These range from the Standard Quick Release Base (TUSB), which is fixed into a single angle, to the Articulating quick releases that utilise ball joints to support multiple angles and adjustments. 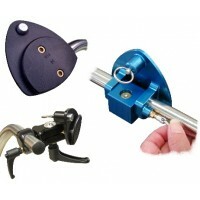 For an overview to help choose a Quick Release Base please click here. USB: Flat Quick Release Base for attachment to other Daessy mounting components or for custom ada..
TUSB: The standard quick release base connects a device to the horizontal tube of a mount. The an..
MUSB: A smaller version of the Standard Quick Release Base (TUSB), suitable for most smaller and ..
TUSBA: This version allows an attached device to be rotated sideways and then secured in this til..
USBF: The Folding Quick Release Base provides real-time adjustment to rotate the angle around the..
FAQRB: Developed especially for Eye Gaze devices, this is a sideways adjustable Quick Release Bas..
AQRS87: Articulating Quick Release Base (small face) for 7/8” tubing, intended for smaller ..
AQRL87: Articulating QRB (large face) for 7/8” tubing. A ball joint makes multiple angle an..
AQRS87-1H: Articulating Quick Release Base (small face) for 7/8” tubing, one-handle version..
AQRL87-1H: Articulating QRB (large face) for 7/8” tubing, one-handle version. A ball joint ..
AQRS87-2H: Articulating Quick Release Base (small face) for 7/8” tubing, two-handle version..
AQRL87-2H: Articulating QRB (large face) for 7/8” tubing, two-handle version. A ball joint ..
CAMQR494: Manfrotto 494 Mini Ball Head Camera Fitting with Daessy adaptor to attach to the 7/8&qu..
CAMQR391: Manfrotto 391 Pan Tilt Head Camera Fitting with Daessy adaptor to attach to the 7/8&quo..
CAMQ87: Precise framing for seamless transition between photo and video. The innovative MHXPRO-2W..